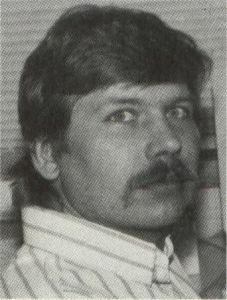 Kirk Stover has had many programs published in STLOQ including Dr. Flop E. Disk in Issue 10, CZ-101 Patch Librarian from Issue 14 and Super Spool from Issue 28. He lives in Minnesota. Since the 520ST hit the market, there have been very few action games available where two people can play against each other at the same time. Here's a game of speed and skill for two players that's a lot of fun to play. In Line Attack! the object is to draw the longest line possible, using right-angle turns. The longer your line survives, the more points you accumulate. You will crash whenever you run into your opponent's line, run into the border or run into your own line. At the same time you're trying to add points to your score, you try to make your opponent crash by forcing him to turn. You may move up, down, left and right. If you try to reverse on your own line, you will crash. If both players run into each other head-on, both will crash, which results in a tie. The round ends with the first crash, and the winner receives all of his points, while the loser receives no points at all. The action can be paused at any time by pressing the fire button and resumed by pressing the fire button again. To play Line Attack!, you'll need two joysticks and a color monitor in low resolution mode. To begin, simply double-click on LNATTACK.PRG. You will then be presented with an option screen to choose which skill level you want to play and how many rounds per game. Use Joystick 1 to control the options. The bar indicator represents the relative skill. The further to the right you move the bar, the more difficult the game. This is achieved by moving the joystick up or down. The rounds per game are determined by moving the joystick left or right. When the bar indicator is at the far left you will have one round of play. If you move the bar to the far right, you will have nine rounds of play. After your selections have been made, you start the game by pressing the fire button. However, if you wish to quit, you can press the Undo key. After pressing the fire button the playing screen will be displayed with two dots on it. Joystick 1 is the blue player, and Joystick 2 is the green. Your lines grow from these two dots. There is a status line at the top of the screen that displays both players' scores. At the start of each round, the status line displays the current round number with a prompt to begin. Press the fire button to begin, but be ready—Line Attack! is a fast-moving game. A feature that makes it easier to play is that you don't have to hold the joystick in the direction you want to go in order to keep moving. Once you turn, you can release the joystick, and the line will continue in that direction until you turn again. Be careful when moving your joystick, as diagonal moves are ignored. When the round is finished, the status line will flash the winning player. There will then be a short delay, and the new screen for the next round will appear. After the final round is finished, the winner of the game is declared, and you press the fire button to return to the option screen in order to play again or quit. Line Attack! was written in assembly language and was challenging to write because I found myself working with several things I had only used separately in the past. 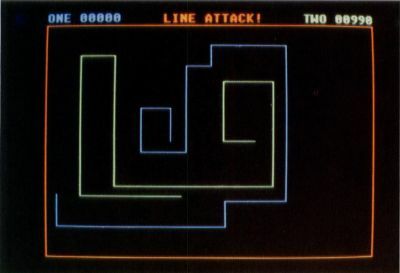 For instance, Line-A routines were used to place the pixels and determine collisions. Colors, text and graphics were accomplished using the VDI. The AES was used for growing and shrinking boxes to simulate explosions. The intelligent keyboard was placed into the joystick interrogate mode in order to read the joysticks. The real fun, though, is playing it. I'll warn you: Line Attack! is definitely habit-forming!